Students with a TOPIK score have higher chances to get NIIED KGSP Scholarship. Prepare for TOPIK with Complete Guide to TOPIK – Self-Study Package. 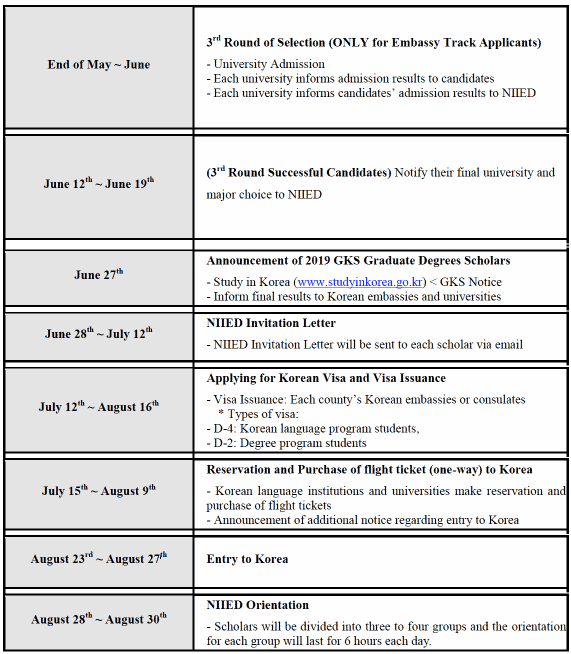 NIIED has announced the application guidelines of the 2019 Korean Government Scholarship Program for Graduate Degrees. For the year 2019, they are inviting 840 international students from 155 countries, for degree (Master’s & Doctoral) and non-degree research programs. ○ Global Korea Scholarship is designed to provide international students with opportunities to study at higher educational institutions in Korea for graduate-level degrees, which will enhance international education exchange and deepen mutual friendship between Korea and participating countries. ※ As Korean Government Scholarship Programs have been integrated and branded as Global Korea Scholarship in 2010, the name is changed to GKS (Global Korea Scholarship). ※ Overseas Koreans refer to ethnic Koreans who do not own Korean citizenships. They include Korean adoptees and offspring of Korean diaspora or Korean immigrants who live in countries out of the Korean peninsula. 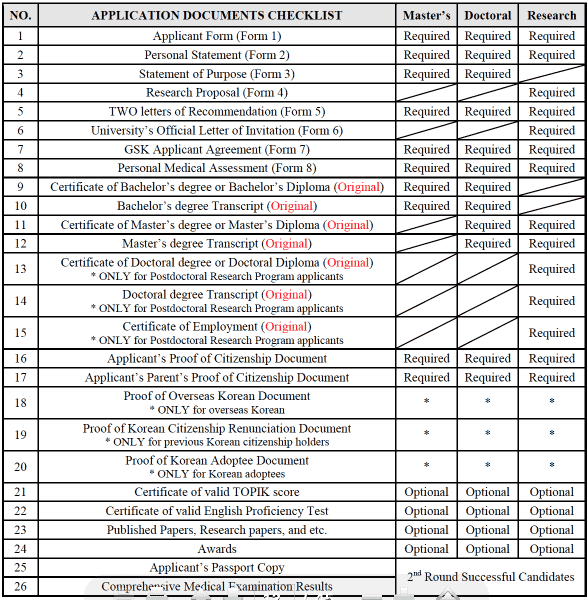 – Embassy Track applicants must submit their application documents to the Embassy of the Republic of Korea in their respective countries of citizenship (refer to Appendix B for the list of Korean Embassies) and can apply to all available fields of study offered by 67 designated universities (Type A + Type B universities, refer to III. Available Universities and Fields of Study). – Refer to section VI. Selection Procedures for more details on the selection process. – The quota allocation is decided based on the mutual agreements on cultural and education cooperation between Korea and the countries listed above. 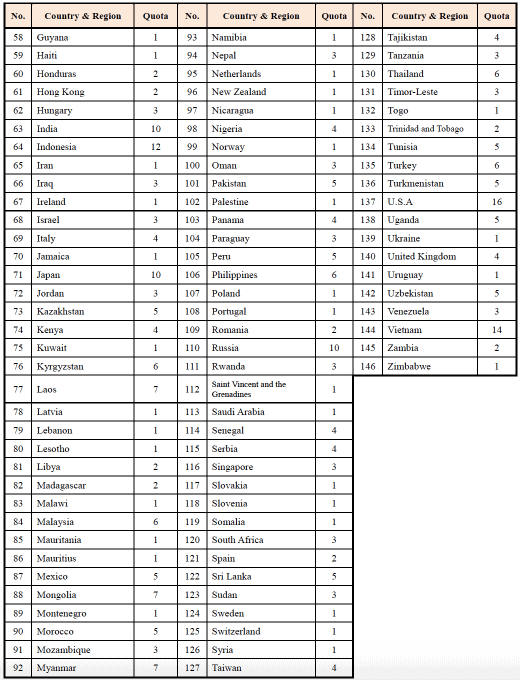 – Among the assigned 480 Embassy Track quota, 20 are separately reserved for the overseas Koreans from 18 countries. The overseas Koreans submit their applications to the Korean embassies in 18 countries where they hold citizenship and will be selected from their own applicant pool. – Korean Adoptees who have graduated or are expected to graduate from Korean universities are eligible to apply through this track. – Applicants who plan to apply to GKS through the University Track must submit their applications to the university of their choice (Refer to III. Available Universities and Field of Study). – Refer to section VI. Selection Procedures for more details on the application process. – Among the assigned 330 University Track quota, 245 candidates will be selected from all available fields of study offered by 67 designated universities (Type A + Type B universities, refer to III. Available Universities and Fields of Study). – Applicants of the University Track must choose the option “General” for the type of application (Application Form 1). ○ The Research Program candidates are selected from 155 countries that are invited to take part in 2019 Global Korea Scholarship for Graduate degrees. 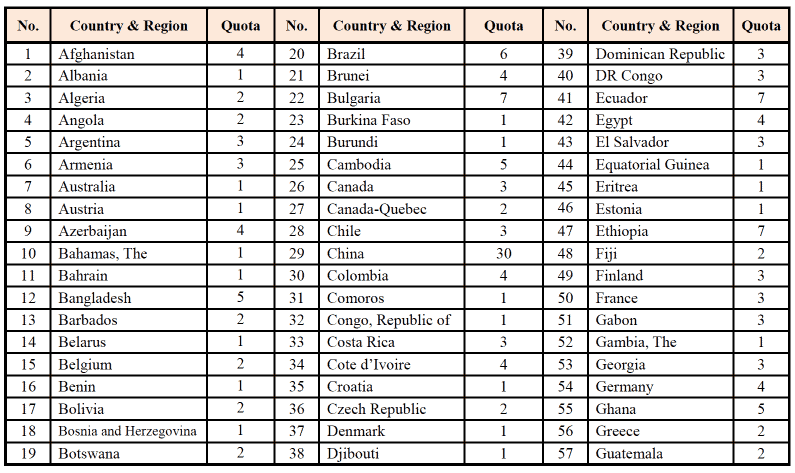 There is no reserved quota per country. ○ The Research Program applicants must receive invitation from universities prior to applying to this program. 1. Available Universities: 67 universities designated by NIIED. ○ For more detailed information on majors (fields of study) offered by the universities listed above, refer to the “University Information” file attached under the GKS Notice post in our Study In Korea website (www.studyinkorea.go.kr). ○ Applicants must choose their majors (fields of study) that are only listed in the “University Information” file. ○ Please be advised that even if a university’s departments or majors you intend to apply offer English-taught courses, it may vary by lectures offered each term. Thus, we highly advise you to double check with your university. Furthermore, we would like applicants to keep in mind that Korean is the core language to be used in every Korean university. ○ Night School, Short-term seasonal programs, online and distant-learning programs are not available to apply and admission is not permitted. ○ All applicants and their parents must not hold Korean citizenship. ○ Korean citizens and dual citizenship holders (one who have Korean citizenship and citizenship of another country) are NOT eligible to apply. ○ Applicants and their parents who had previously held Korean citizenship must submit the document that proves their renunciation of Korean citizenship. 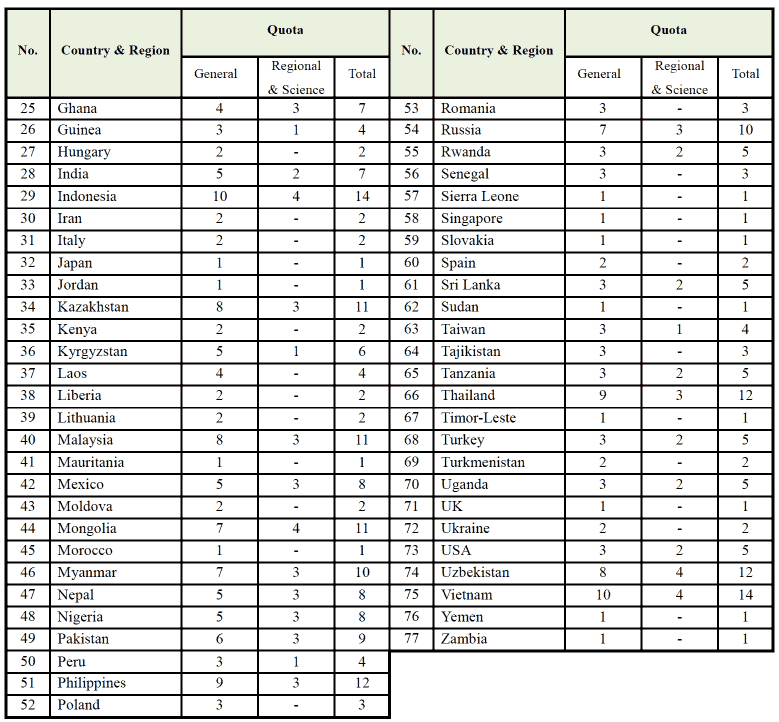 ○ Academic professors who are under 45 years of age as of September 1, 2019 (born after September 1, 1974) and hold citizenship of one of Official Development Assistance (ODA) recipients listed in the table below are eligible to apply. ○ Applicants must hold or must be expected to hold a Bachelor’s, Master’s or a Doctoral degree by August 31st, 2019. – Research Program Applicants: Must hold a degree or a level of education equivalent to or higher than a Master’s degree and must have received an invitation from one of NIIED’s designated Korean universities.  Postdoctoral Research Program: Must hold a doctoral degree or a level of education equivalent to a doctoral degree.  Professor Exchange Program: Must hold a Master’s degree or a level of education equivalent to or higher than a Master’s degree.  Program for Education·Science·Culture·International Professionals: Must hold a Master’s degree or a level of education equivalent to or higher than a Master’s degree. ○ Applicants who are expected to graduate at the time of applying must first submit the certificate of expected graduation at the time of applying. The official degree certificate (or diploma) and final academic transcript must be submitted by August 31st, 2019 at the very latest. – In case an applicant fails to submit the above mentioned document by August 31st, 2019 or does not fulfill the grade requirement, the scholarship will be forfeited. ○ Applicants who have previously studied in a Korean university as exchange or visiting students can apply to this program. – Submit their applications through either Embassy Track or University Track and must be selected from one of those two institutions in the 1st round of selection. – Can only re-apply for the higher degree program once (Bachelor’s→ Master’s, Master’s→ Doctoral) and must have overall grade point average equivalent to or higher than 90%. ○ If an applicant has a CGPA below the minimum grade requirement, the applicant will be disqualified and application will be disregarded. ○ If an applicant holds a transcript that does not include information on grade point average or is unable to convert his or her grades into any one of the GPA criteria mentioned above, then applicant must submit an official document issued by the applicant’s university describing the university’s grade system. ○ All applicants must be in good health, both mentally and physically, to study in Korea for the full duration of degree or research programs. ○ All applicants must submit Form 6 or the “Personal Medical Assessment” at the time of applying. ○ All applicants who pass the 2nd round of selection must receive comprehensive medical checkup and submit the certificate of health and medical examination result issued by a medical doctor or a licensed physician. – An applicant owns serious illness that prevents him or her to study abroad for long period of time including the full duration of degree or research program in Korea. ○ Former applicants who had withdrawn from the scholarship after being selected as GKS scholars (applicable to those who did not come to Korea after being selected as GKS scholars and who had resigned from their studies) in the past are strictly NOT eligible to apply.  Previous GKS scholars whose scholarship was forfeited during the scholarship period are strictly forbidden to reapply to Global Korea Scholarship program.  However, a former GKS scholar whose scholarship was forfeited due to a scholar’s failure to achieve TOPIK level 3 or above after completing Korean language program may be deemed eligible to reapply if a scholar receive TOPIK level 5 or above. ○ Applicants who apply for majors in the field of Natural Science and Engineering are given priority when they receive same marks with other candidates. ○ Applicants who apply for majors under the Industrial Professionals Training Project are given priority when they receive same marks with other candidates. ○ Academic professors holding citizenship of developing countries, especially ODA recipients, are given priority when they receive same marks with other candidates. ○ Descendants of Korean War veterans will receive additional 5% of the total marks. ○ Applicants from low income families or underprivileged backgrounds will be given preference. ○ Applicants who are confirmed to be the ‘third generation’ or ‘post-third generation’ overseas Koreans will be given preference. 1. List of required documents for Master’s and Doctoral degree applicants. ○ All application documents must be written either in Korean or English. or English translation, authenticated by the issuing institution or notarized by a notary public. ○ All application documents must be presented in their original forms. If an applicant has to submit photocopied documents, applicant MUST have the photocopies notarized, apostilled, or receive consular confirmation and submit those certified documents. ○ All documents submitted will NOT be returned to the applicants in any case. ○ Application documents must be submitted in the order of the checklist on the first page of the application forms. Each required document must be numbered and labeled on the top right corner. ○ Any fraudulent or incomplete applications will be disregarded. – If an applicant fails to submit official degree certificate (or diploma) and final academic transcript by August 31st, 2019 or does not fulfill the grade requirement, the scholarship will beforfeited. ○ The recommendation letters must be written by two different recommenders, who can give thorough assessment on applicant’s academic abilities. ○ The recommenders must seal recommendation letters in an envelope and sign across the back flap. The letters with broken seal or sign will be considered invalid. ○ For the published papers, research papers, and awards, photocopies are acceptable. ○ Must submit ONE original application documents. ○ Applicants must apply either to a Korean Embassy where they hold citizenship or directly to one ofdesignated universities. – 117 Embassies of the Republic of Korea: In countries where Korean Education Center or Korean Cultural Center is located, these institutions may accept and review GKS applications in lieu of Korean embassies. We highly recommend applicants to contact Korean embassy in their countries to check which party is accepting the application. ○ If an applicant submit application to more than ONE institution, his or her application will be discarded. ○ Those who apply as overseas Koreans must apply to the Korean Embassy in their home countries. Only those who own citizenships of one of the selected countries that have been allocated overseas Korean quota (refer to II.) are eligible to apply. ○ Chinese applicants must submit their applications to the China Scholarship Council, in accordance with the agreement between the government of Korea and the government of China. ○ The Czech Republic applicants must submit their applications to the Ministry of Education of the Czech Republic, in accordance with the agreement between the Korean government and the Czech Republic government. ○ The application deadline is set by each Korean embassy or university. ○ All applicants must check the deadline of application submission by contacting their relevant embassy or desired university directly. 67 universities listed in section III. 3rd round of selection (Refer to “4. Selection Procedure” below). – Applicants must choose a major and ONE desired university among 67 universities. ○ For the list of universities and fields of study that are available to apply, please refer to the “University Information” file attached along with GKS-G announcement post. Applicants submit applications to Korean Embassies or Korean universities designated by NIIED. Each embassy and university selects candidates among the applicants based on NIIED’s selection criteria. ○ Each embassy and university will send the 1st round successful candidates’ applications and related documents to NIIED by April 4th, 2019. The NIIED Selection Committee conducts the 2nd round of selection among candidates that passed the 1st round of selection. ○ University Track applicants who pass the 2nd round of selection are granted admission to the university. In order to be selected as GKS scholars, these University Track applicants MUST submit their comprehensive medical examination results and other additional required documents. – All candidates who pass the 2nd round must get comprehensive medical examinations based on NIIED’s Certificate of Health form and submit the medical examination result issued by a medical doctor or a licensed physician. – The Certificate of Health form will be posted along with the announcement of successful candidates of 2nd round of selection. – If the medical examination result shows that an applicant is not suitable to study and live overseas for the extended period of time, he or she will be disqualified. The applications of the 2nd round successful candidates will finally be reviewed by the universities for admission. The final round successful candidates must receive admission from at least one of the universities they applied in order to be selected as GKS Scholars. ○ Applications will be reviewed by each round’s selection committee. – Certificates of Language Proficiency (Korean or English), publications, awards, and etc. applying to this program and up until the designated arrival period. – The return flight is NOT offered to those who have withdrawn from the scholarship in the middle of their studies. – Any fees domestic travel fees within a GKS scholar’s home country are NOT covered. – International travel insurance is NOT covered. – For GKS scholars selected in China and Czech Republic: The flight tickets will be prepared and provided by the government of China and Czech Republic, respectively, in accordance with the agreement made between Korean government and the governments of two countries. – Tuition amount covered by NIIED is maximum 5million KRW, and the amount that exceeds 5 million KRW will be covered by scholar’s university. – University Admission fees are waived for GKS scholars. – Maximum reimbursable amount for each scholar: 500,000 KRW for Liberal Arts and Social Science majors, 800,000 KRW for Natural Science & Engineering and Arts, Music & Sports majors. – This special grant is given only to GKS scholars in the degree program who have attained valid TOPIK level 5 or 6. – Offered to GKS scholars who return to their home countries after completing their degree coursework under the scholarship program. ※ Korean Proficiency Grants, Korean Language Training Fee, Degree Program Tuition, and Thesis (Dissertation) Printing Fee are ONLY given to degree-pursuing scholars. ○ The scholarship period for the degree (Master’s-2years, Doctoral-3years) and research program (6months) cannot be extended once the scholarship is terminated. ○ The period change during the Korean language program will not affect the scholarship period for the degree program. In other words, even if a scholar’s language program shortens to 6months instead of a year, the scholarship period that GKS supports for his or her degree program will remain the same (2 years for Master’s degree and 3 years for Doctoral degree). – GKS scholars who have already received valid TOPIK level 5 or 6 at the time of applying are exempt from a yearlong Korean language program. Thus, the total scholarship period will be 2years for Master’s degree scholars and 3years for Doctoral degree scholars. – Those who receive TOPIK level 5 or 6 within the first 6months of the Korean language program will be exempt from 6-month language training and must start their degree program in the following semester. The total scholarship period for these scholars will be shortened to 2.5 years for Master’s degree scholars and 3.5years for Doctoral degree scholars. ○ Research program scholars, upon their completion of the program and before returning back to their countries, must submit their thesis or research results that include methods, data collection, and discussion of the findings as well as the academic advisor’s evaluation on scholar’s performance. ○ All scholars, unless exempt, must take one year mandatory Korean Language Program at Korean language institutions assigned by NIIED. – GKS scholars who have already received valid TOPIK level 5 or 6 at the time of applying are exempt from a yearlong Korean language program and must directly enroll in degree program. – GKS scholars who receive TOPIK level 5 or 6 within the first 6months of the Korean language program are exempt from the subsequent 6-month language training and must start their degree program in the following semester. – All applicants and scholars must submit valid TOPIK certificates to NIIED. – If one wishes to be exempt from the Korean language program, the 64th TOPIK score is the last TOPIK score one can report to NIIED to request for exemption from the Korean language program. One must submit the valid TOPIK certificate to NIIED and his or her university by end of June, 2019. – The language institution is not located in the same city as the scholar’s degree pursuing university. ○ Korean language institution for each GKS scholar will be announced along with the list of finally selected GKS scholars. ○ GKS scholars cannot change their assigned Korean language institutions in any case. ○ GKS scholars must live on-campus during the Korean language program. – Most dormitory rooms are shared with roommates. – Accompanying family members is strictly forbidden during the Korean language program. – A scholar with a valid TOPIK level 3 or above may choose to live on- or off-campus. Korean language program, in order to proceed to the degree program. ○ Universities and Korean language institutions will enroll in medical insurance plan on behalf of GKS scholars. ○ The medical insurance plan will be effective immediately after one’s arrival in Korea. ○ The medical fees incurred during the insurance enrollment period will be reimbursed by the insurance company. – If a GKS scholar has to receive medical treatment, one must first pay for the medical bills and submit receipts to one’s insurance company. – The insurance company will refund partial or full amount of the medical bills (depending on the insurance plan). It is GKS scholar’s responsibility to check the insurance terms and policies provided to the scholar when one enrolls in the insurance plan. ○ The medical insurance will not cover the expenses for dental care or chronic disease. ○ One who withdraws from the scholarship after being selected as a GKS scholar will NOT receive degree completion grants and airfare for returning back to one’s country. ○ If a GKS scholar withdraws from the scholarship within the first 3months after entering Korea, one MUST return the full scholarship amount that he or she has received after being selected as GKS scholar. This will include the airfare from one’s home country to Korea, settlement allowance, monthly allowance, language training fees, medical insurance fees, and etc. – Former applicants who had withdrawn from the scholarship after being selected as GKS scholars in the past are strictly NOT eligible to apply. ○ Changing the university or transferring to a different university under this scholarship is NOT, in any case, permitted. – With the scholarship period unchanged (2 years for Master’s degree and 3 years for Doctoral degree). You can read the Frequently Asked Questions about NIIED KGSP Scholarship 2018. The deadline will be decided by each office that accepts the application documents, i.e. the Korean Embassies or selected universities. Please make sure to check their separate announcement for the deadlines. Your blog is really good and proved a knowledgeable medium for the community. 한국에서 유학 가는 게 제 꿈이야…..
Hello my name is joseph and I come from ivory coast, i would like to get a maximun information about NIIED scolarship and i’m very interested about that opportunity to study in South korea. Do you have to apply for the 3 desired schools before applying for the scholarship when using the embassy track? No. You will submit only one application but will choose 3 universities of your preference. The embassy will send a copy of of your application to all 3 universities. Sorry but I couldn’t understand your question. You can definitely go to Korea for studying. If you are a native English speaker, you can also apply for English teaching jobs. hi my name is seemab and i have done bs (hons) in political science. can i apply for ms political science??? its my dream to study here . plz guide me to apply for this scholarship?? and also tell me the deadline for the scholarship?? All the details are there in the guidelines. Download and check the files. You can apply for as many scholarships as you want, in Korea or anywhere else. It’s just that you can’t avail more than one scholarships at the same time. So if you get selected for two or 3 scholarships, you will have to choose one. Hello, I wanted to ask if I can send my application to the embassy as PDF Or should I printed it and delivered it to the embassy? You need to contact embassy directly regarding that. Is it possible to apply for this scholarship after graduating high school? There is a separate KGSP Undergraduate scholarship. You can apply for that. Hello. It is really very good chance for us to study in South Korea. And, I also want to apply for this scholarship. I have a bachelor’s diploma in English teaching. But I don’t have IELTS degree. Can I apply for this scholarship? I want to study a korean language to help my co filipino. Hi,is possible that people from Spain can apply ? Hello i’m from myanmar.I interested in this program. I really really want to be granted this scholarship. Korean has always been a country I like among all the other countries I hope I can be accepted thanks.